both KJB and I are close to our families and it was important to us to recognize that the success of our relationship and marriage would be modeled after our parents and grandparents. so one of my favorite things at the wedding reception was a cute little display of our affection for their marriages. the display was set up directly across from the entrance to the reception site, so it was one of the first things you saw walking in. the banner reads "How Forever Feels" which is special to us for two reasons; first, it's a Kenny Chesney song we both love and second, it's a great way to express what marriage should feel like. i encourage you if you are wedding planning to incorporate something so personal into your decor. our parents and grandparents loved this, and the guests loved seeing the old photos. our parents wedding photos are on the second row and grandparents on the third. 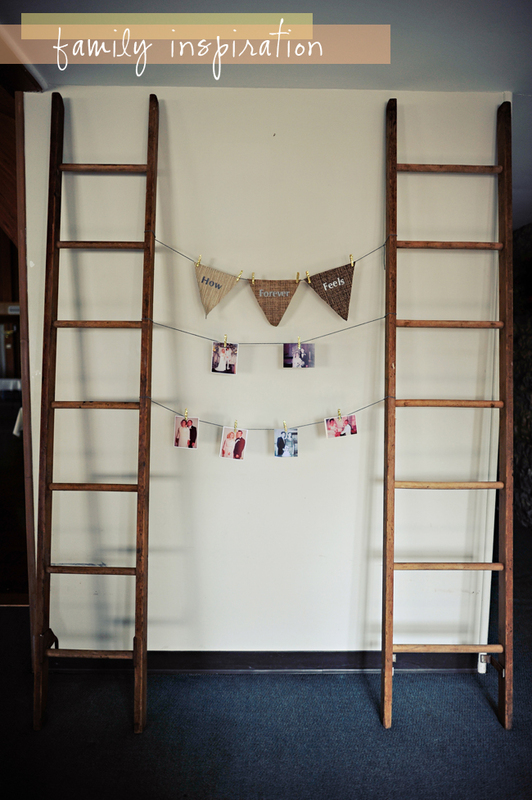 barn ladders fit the rustic decor for our site and reception style, but you could use anything you want. (this would look nice between trees or tent posts at an outdoor reception.) my fabric triangles were brown tweed in three shades and my letters i actually printed in gray and cut out by hand - definitely look for stickers because this took forever. since i had some other glitter in other decor, i covered mini clothes pins with gold glitter. the photos I enlarged to the largest size i could without pixelating them- which you can see wasn't very big. these are around 4" x 6" prints. 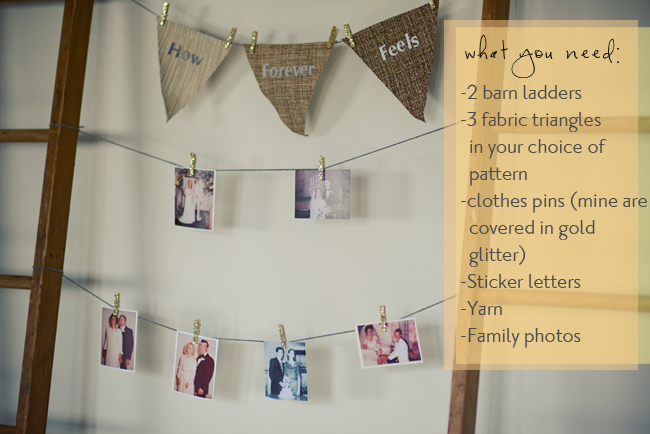 did you incorporate family photos into your wedding decor? or will you do it when the time comes? how will you recreate this to fit your decor style? Thank you for sharing this information on how to make a wedding decoration in a barn. The food was very good as wedding reception food goes--much better than typical hotel reception hall food. But I felt that beer selection at the bar was weak though.